Looking for an experienced, reliable site contractor? 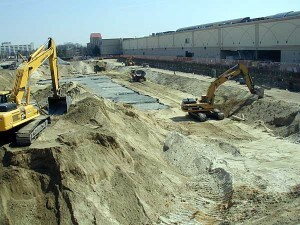 Marois Brothers, Inc. can readily handle your grading and excavation projects. With sufficient ability and over 75 pieces of equipment at our disposal, we strive to deliver a successful job within your timeframe and budget. We have completed earthmoving and rock removal on large-scale projects with mass volumes containing up to one million cubic yards of material.